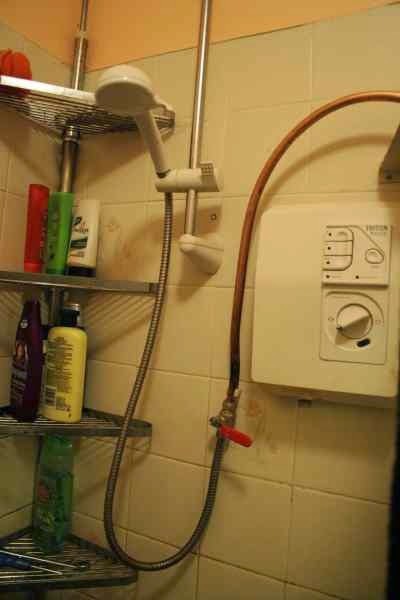 We have an old electric shower here. It's very feeble, but in summer it does provide our only source of running hot water; for anything else we have to boil the kettle. The long term plan has always been to replace it with one plumbed into the hot water system, but that rather depends on having a fully functioning hot water system, which depends on having solar panels to heat the water in the summer. In the winter we light the fire every day for heating, and that provides heat for the water, too. The other day I had a shower and it seemed even feebler than usual. I had to turn the flow down to the most pathetic dribble to get the water anywhere near a comfortable temperature. I thought it was just because the incoming water is very cold, but Ian pointed out that it wasn't this bad when the outside temperature was -15°C, and concluded that there's something wrong with the shower. Since there was still some heat, we thought it most likely that one of two heating elements had burnt out. If we could replace that fairly cheaply, our electric shower could limp on a little longer, giving us time to plan a replacement. While I looked up replacement elements, Ian took the cover off the shower unit (after switching off the power at every possible point) to investigate. I heard a startled, Ugh! from the shower room. Was it full of water? I asked. No, mice! Yes, that's right. There were mice in our shower fitting, snuggling up to the water heater. At least, presumably that's what they'd been up to when they were alive, which they weren't any more. This raised our hopes that the fault might be as simple as a chewed wire, but alas, there was no sign that the mice had done any damage before getting electrocuted. In the meantime, I learnt that heating elements are not sold individually, but a replacement heater can assembly may be purchased... for £67.44. We could buy a new shower for not much more than that. OK then, it's not worth buying a replacement part for the old shower - perhaps now's the time to plumb one into the hot water system. This required decisions. The key question is how to get the water coming out at the right temperature. Trying to keep things as simple as possible, I thought that a manual mixer tap might do the job, as our hot water temperature is pretty stable. The alternative is a thermostatic mixer, but I'm not convinced by their reliability, and I assumed they'd be a lot more expensive. Ian looked to the internet to investigate the latter question, while I thought about what other information we might need. Before abandoning the electric shower entirely, it would be nice to know that our system can supply enough hot water for a shower. It was designed to (by me), but not with much spare capacity, and we don't get the thermal store as hot as I'd originally expected to. Some testing would be necessary. Much as it pained us to take so much heat out of the store, it was the only way to get the answer. Testing step 1: Run the shower at a desirable flow rate and see how long it takes to fill a bucket. Answer: 2 min. Step 2: Gather up enough buckets for fifteen minutes worth of water. 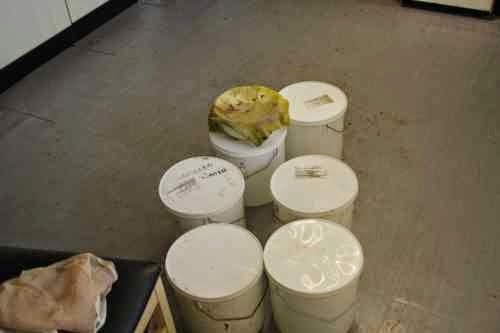 Actually I only got seven; one was full of sloe wine, one was full of engine oil, and I don't know where the tenth is. Still, a fourteen-minute shower is close enough for testing purposes. Step 3: Run the shower at a desirable temperature and measure this with a thermometer. Answer: 39°C, which Ian cross-checked with advice online, and found to be much what everyone else says, which is reassuring. Step 4: Use the kitchen tap, which is a simple mixer tap, to fill the buckets, trying to maintain the same flow rate and temperature as we'd want from the shower. There are two questions here: How easy is it to keep the temperature steady, and can the thermal store supply that temperature of water for the duration of a shower? The thermometers on the store at the start of the test read 60°C at the top and 40°C in the middle, which is somewhat lower than full , but quite typical in the morning after the heating's been on for a couple of hours. The good news is that the temperature held up quite well for the fourteen minute test. The bad news is that it was very difficult to maintain the temperature in the first five minutes. The hot tap may run at a steady temperature, but the pressure's all over the place, so I was constantly fiddling with the taps until it eventually settled down. That's no good. So much for a simple mixer tap. Buckets of warm water. We left them in the kitchen so that as they cooled down, the heat would warm the house. It was also quite a good place to put a bowl of bread dough to rise. 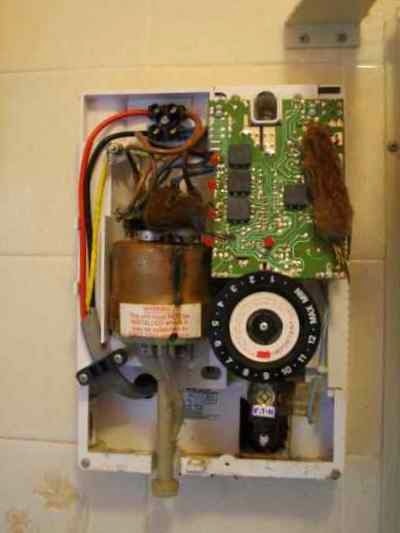 Ian's research into thermostatic mixers wasn't very encouraging, either. They seem quite fussy about what inputs they require. In particular, he didn't think our system would be able to provide hot enough water - at least not consistently - for the things to work properly. Hmm, neither of the two options we were considering look very good. On the subject of thermostatic mixers, we do have one in the system already. Ian's never been convinced that that's what it actually is, but after learning more about them he realised that it's probably just not doing anything most of the time, because the input water isn't hot enough. With the thermal store now hotter (the fire had been lit for some hours by this time), he measured the hot water temperature and found that it was 55°C. That's hotter than we'd ever want coming out of the tap. I reckon 43°C is about the hottest I'd want for doing the dishes, before I'd need to add cold to make it useable. That's not very much higher than we want for the shower. What if...? What if we turn down the setting for household hot water to a temperature that's comfortable for showering? That way, we wouldn't need a mixer tap at all, either manual or thermostatic. It may seem a bit primitive to have no temperature control in the shower but really, we don't need the temperature to be variable, we just need it right. If the household supply can achieve that, why add anything else? The simplicity of this solution certainly appeals. We can always try it, and if it doesn't work well, upgrade later. The next step was to plan the design and see what materials we already had available. We're not fussy about appearance - one day we'll make our bathroom nice, but that's a big job for sometime in the future, no point faffing about with buried pipework now. 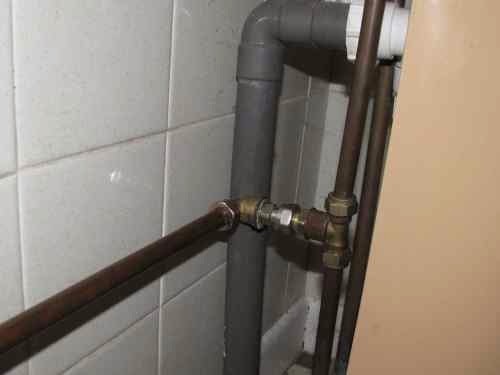 The plan was to insert a T joint into the hot pipe under the basin and take a pipe from there into the shower, attach a tap and fix it to the wall. The existing shower head has a standard screw fitting, so we can use that. We found a length of 15 mm pipe that had previously been connected to the old gas tank. If you watch the video in that link, at the end you'll see the man come over and tie a knot in the pipe. I had to cut that bit off. We also had a few short bits of 15 mm pipe, and various connectors. The old gas pipe looked just about long enough, but until I'd bent it into shape, I couldn't be sure, so the next job was pipe bending. Ian was getting quite twitchy at this point as we didn't have much time before the shop shut (it being Sunday afternoon). 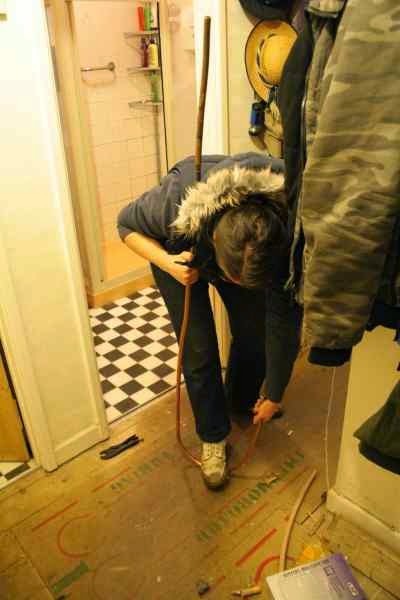 I insisted that it wasn't worth going to the shop until we knew what we needed, and continued bending the pipe. It really was only just long enough to go over the shower screen and have one end low enough to clear the trap on the basin, and the other end low enough that the tap wouldn't hit the old shower unit (we're keeping that as backup. It's not good, but if the hot water runs out completely, it's better than nothing). Then we went and bought parts. All we needed were a tap and one elbow joint. I also bought a bag of olives - the sleeves that go inside the nut in a compression joint - because we have plenty of nuts and it would be really annoying to have to stop work for want of an olive. The total cost of parts was less than £10. After that, and a tea break and chat to my dad (he called) it was just a matter of turning off the water then being brave and cutting into the pipework to attach all these bits. For some reason, our water wouldn't turn off completely, leaving it dripping. This is very annoying, but does provide an instant check for leaks. I didn't finish connecting everything up until after dinner. I went round all the nuts, tightening them up and chasing the drips from joint to joint, until there was just one that was still leaking. I tightened further... the dripping increased. I went and slumped on the sofa in despair and Ian took over. 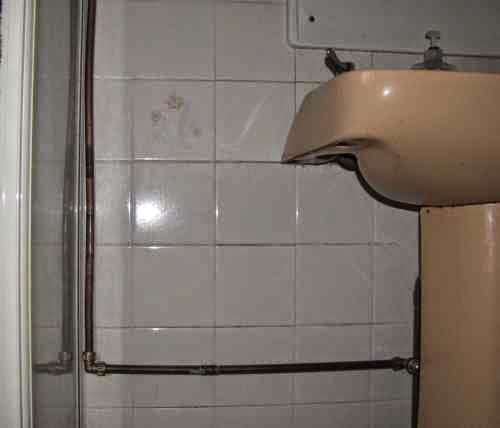 He tried applying sealing gunk, but that didn't help, so he removed the offending pipework. That would be the problem, right there. The connector was cracked. No wonder it wouldn't stop leaking. Ian then went off and searched for more parts, and found another elbow that I'd missed earlier. Unfortunately I'd used the last of the PTFE tape on the previous joint and the gunk he'd already tried wasn't really the right stuff. And the joint was still dripping. He searched some more and found some very old jointing compound. It took a lot of scraping and stirring to recombine the solid and liquid parts, but eventually we had something that looked like it might be smeared on a screwthread. Ian did this bit, and put it all back together with the replacement elbow. ... though perhaps less so at the shower end. Yes, we did choose that tap. So how is it, then? I had a shower this morning. I didn't really need one, but I had to test it, even though the thermal store was a bit on the cool side (we were too busy plumbing yesterday to pay full attention to the fire). The temperature, once the hot water came through, started at slightly hotter than I'd want but quickly dropped to slightly cooler. It wasn't uncomfortably cool, but didn't encourage lingering. That was OK, though, because the pressure was so much higher than I'm used to. I'm sure the flow rate was much higher than we used in the test, and not easy to turn down, but it was lovely! With that much water I can get clean quickly, so I don't need to spend fifteen minutes, and it's so much nicer. We will monitor the situation, but so far this is a clear success. Of course, it does put the pressure on to get the solar panels finished before we stop lighting the fire in the spring. Hmmm... I'm totally baffled by this post. So your shower heats its own water? I've never heard of such a thing. Anyhow, it sounds like you've got the problem solved, but I'm still confused. So your home doesn't have hot water in general? Oh, are electric showers not a thing where you are, then? Yes, it does heat its own water, or did, until one of the heating elements burned out. As for the home in general, we have an integrated heating and hot water system, which is not very common (that is, this particular kind of system is not common - other integrated systems are). It all centres on a big tank of water called a thermal store. When that's hot, we can draw heat from it for either heating the house or hot water, or both. In theory, we have three ways of getting heat into it: The wood burning stove, which we use in the winter, electric immersion heaters (two), which we try to avoid using because that's an expensive and inefficient way to heat water, and solar panels, which aren't quite finished yet. That means that in winter, we have hot water but it might run out, or at least get less hot, if we haven't burned enough wood that day. In summer, we'll have lovely free hot water just so long as the sun shines (!) and just as soon as I get those solar panels finished. Well, I'm guessing electric showers must exist - maybe people who live in cabins up in the mountains might have something like that, but I've never heard of the idea before. Of course, I'm always thrown for a loop when I realize that not all homes have natural gas service. In these parts pretty much every home has a gas powered hot water heater - if you had a fancy in-floor heating system like you've got, then you'd probably have a really big one, or multiple tanks. So, one question about solar water heating in general, how do you make sure it doesn't overheat and cause a dangerous situation? I guess I'm assuming there's a heat exchanger in the system somewhere so the water running through the panels is separate from the water used in the home - does it just stop circulating if the water in the tank gets too hot? Mains gas is widespread in the UK, too, just not in some rural areas. Most homes have a gas powered hot water heater (generally known as a boiler, though you really don't want it to boil) for central heating, and those often do hot water as well. Good question about the overheating risk. People laugh at me when I talk about this problem, thinking Welsh sunshine and home-made panels are unlikely to produce too much heat, but it's a serious risk! I'm more concerned about excessive heat in the panel loop (yes, there is a heat exchanger) than in the tank, because the tank is huge (350 litres, or 92 of your undersized American gallons). It does have a 'heat leak' radiator connected to it, which theoretically should be open permanently as a safety measure, but our plumber kindly added a valve so we could shut it off and not waste all our precious heat. As he said, the tank itself is a heat sink. The water in the underfloor heating is only pumped round when called for, and is mixed with cold/cooler water (from the return side of the loop) to bring it down to a suitable temperature. There is no danger of burning our feet on the floor unless the controls go wrong. 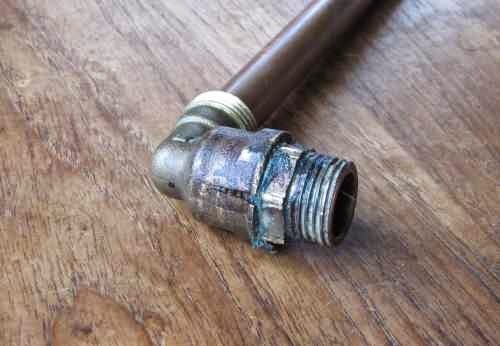 If we do get too much heat in the tank, we open the heat leak radiator valve to let some out there and if necessary, run the hot taps. If this looks likely to be a problem and we want to go away in the summer, there are a couple of options. The simplest is just to cover the panels so they don't get hot. More complicated is to program the pump controller to switch on at night lose heat via the solar panels. I bet you wish you'd never asked, now! Hi Rachel, I reach out to you from Uruguay since i was on internet looking for experience about No Poo. Looking at your fotos related to this shower i have seen a Pantene bottle so I wonder if you have quitted the experience, and if you do, tell me about the reasons, because i am up to started but I still have second thoughts about it! !